Spring is in the air and we have no shortage of ways for you and your business to be involved! In this month's newsletter, you will find some great upcoming events and save the dates. Annual Awards, Annual Golf outing and Youth Appreciation Day! 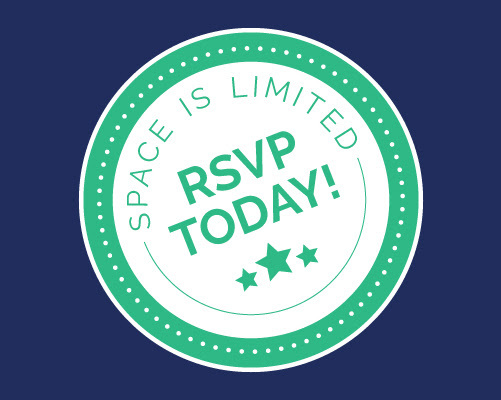 We have sponsorships available, and every event you attend is a great way to meet your next best business connection! Need a new headshot? We have an opportunity for you to do that too! Love food or own a restaurant? 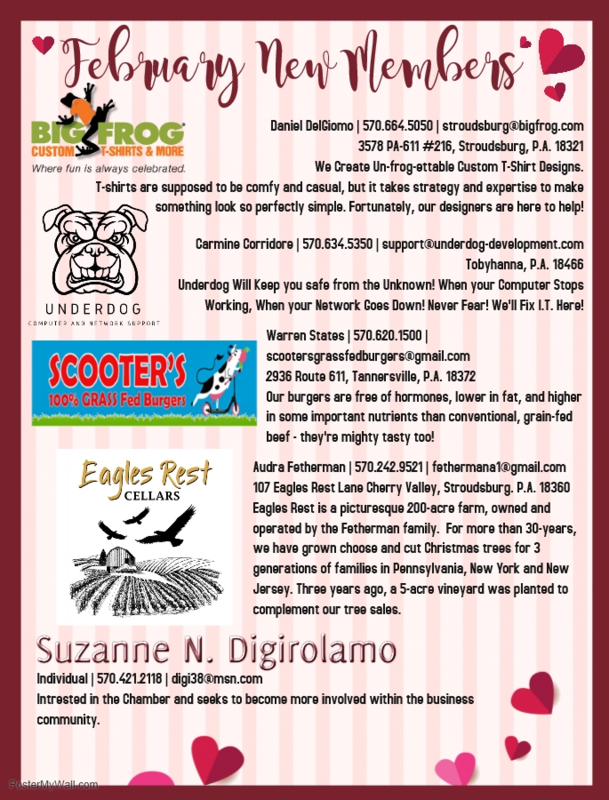 Check out the details on Pocono Restaurant Month! Keep reading! It's a lot of information to get into one newsletter, but we have so much to share with you! Don't forget to check our calendar regularly, not only will you find Chamber events there, but events from so many of our partners. It's a great way to find out when committees are meeting and how to participate! Need to find some new hires? Use our job posting feature! Make sure you have all your details updated in the member information center! If you haven't logged in yet, contact myself or Michael, we would love to help you! Hop to it! We don't want you to miss a thing! Outstanding individual dedicated to supporting the Greater Pocono Chamber of Commerce (GPCC) and other community organizations. Recognizes a business that has demonstrated achievement and innovation in management, workplace excellence and has committed to growing in Monroe County. Recognizes a business that has demonstrated enthusiasm, community spirit and excellent customer service and has committed to growing in Monroe County. Two years or less in business. 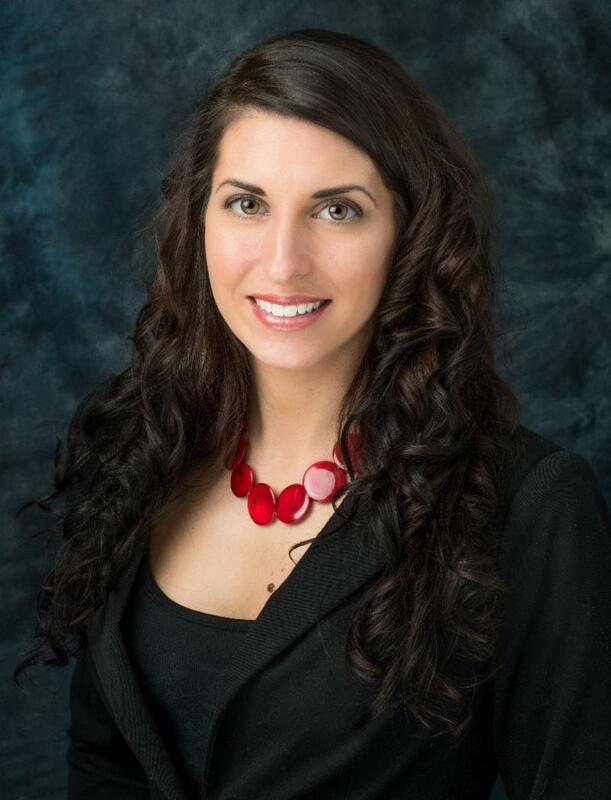 Highlights a Monroe County Young Professional who stands out as a volunteer leader and is involved with the GPCC and community programs. Honors a long time “seasoned” individual who has been involved with the Greater Pocono Chamber and other organizations. This award is presented to a chamber member who has demonstrated a lifetime commitment to the community. The ATHENA Award Program celebrates the potential of all women as valued members and leaders of the community and recognizes those who support them. The ATHENA Award honors an individual who strives toward the highest levels of professional accomplishment…women and men who excel in their chosen field, have devoted time and energy to their community in a meaningful way, and who also open paths so that others may follow. 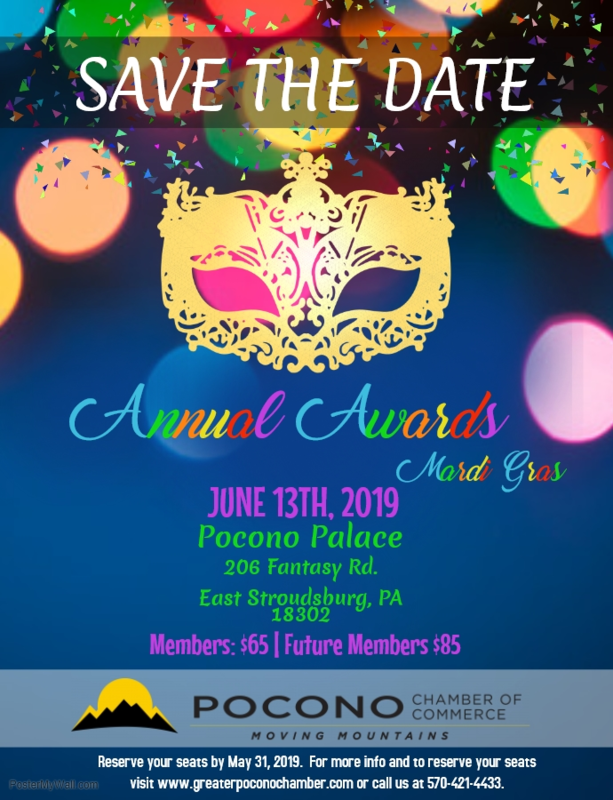 Contact Valerie at vcase@greaterpoconochamber.com to nominate someone for one of these categories, sponsorship details or for tickets! A Taste of the Poconos! 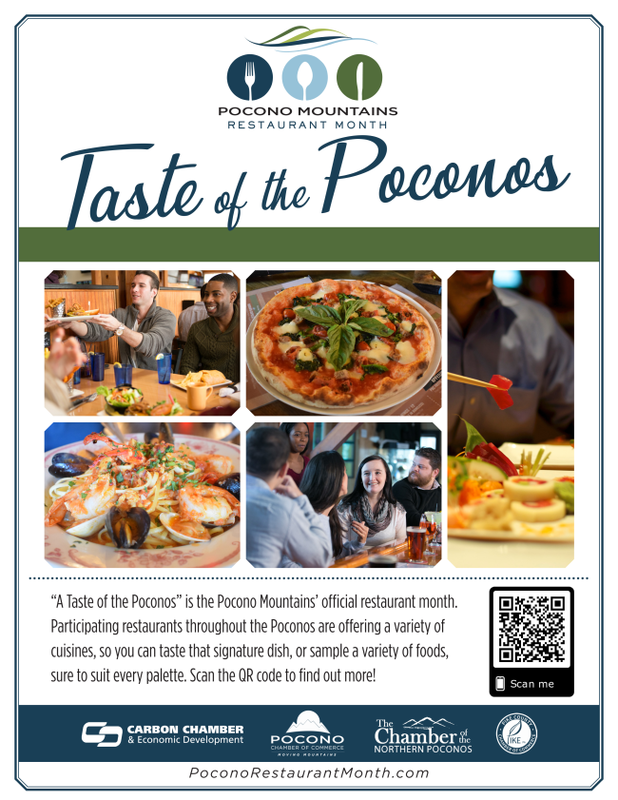 We are so excited to announce Pocono Restaurant Month! We are partnering with the Pocono Mountains Visitors Bureau and the other three counties in the Pocono Region (Carbon, Wayne and Pike) to bring you the most delicious month of the year! April 22nd through May 19th is your chance to taste all that Monroe County and beyond has to offer! Have a restaurant that hasn't signed up yet? 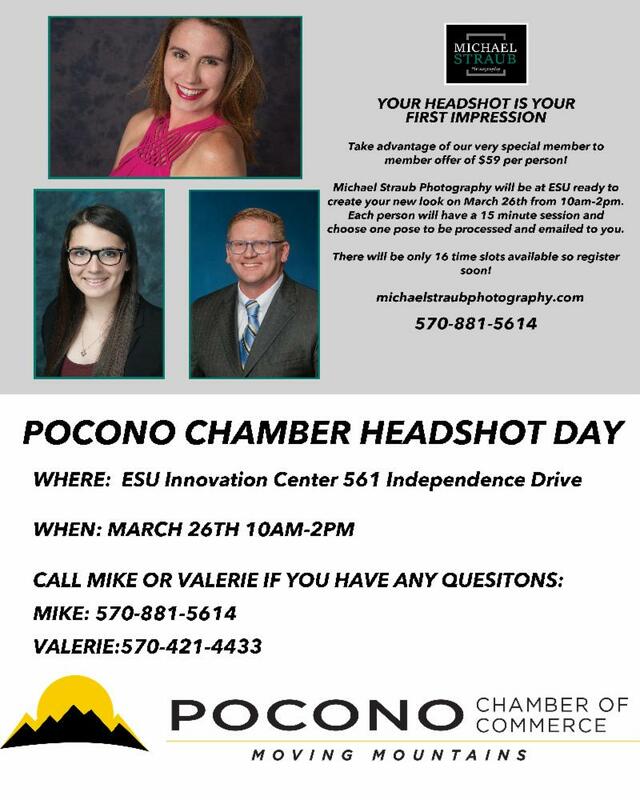 There is still time contact Valerie at the Chamber for all the package details! Click here for full details and participating restaurants! This heartfelt event celebrates eight fine seniors granduating high school after overcoming some serious obstacles in their lives! Thank you to our sponsors so far, PPL and First Northern Bank and Trust Co. The weather is almost warm....so why not start thinking about Golf!?! 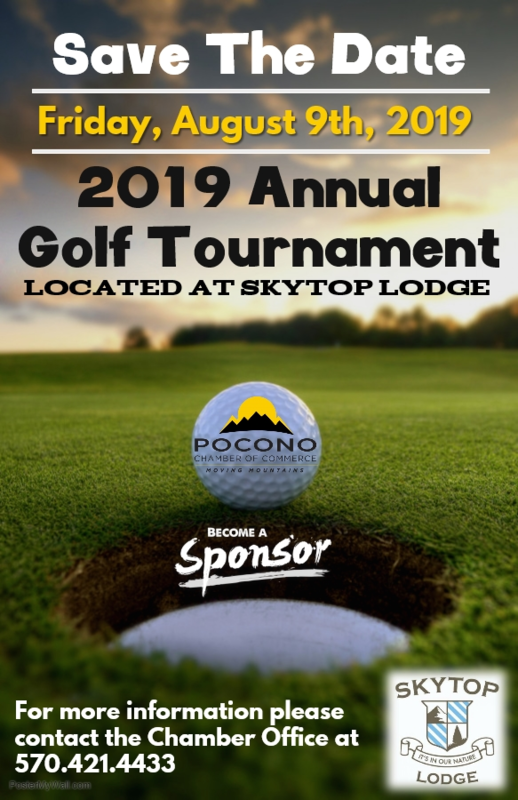 Save the date for The Pocono Chamber Annual Golf outing! We are excited to be returning to Skytop Lodge on Friday August 9, 2019. It is never too early to start planning your golf calendar! Sign up ASAP, registrations will go quickly! Are you in need of a new headshot? Michael will be set up and has room for 16 headshots at the low low price of only $59! This is a steal, do not miss this opportunity to put your best face forward! Contact Michael at 570.881.5614 to book your appointment! 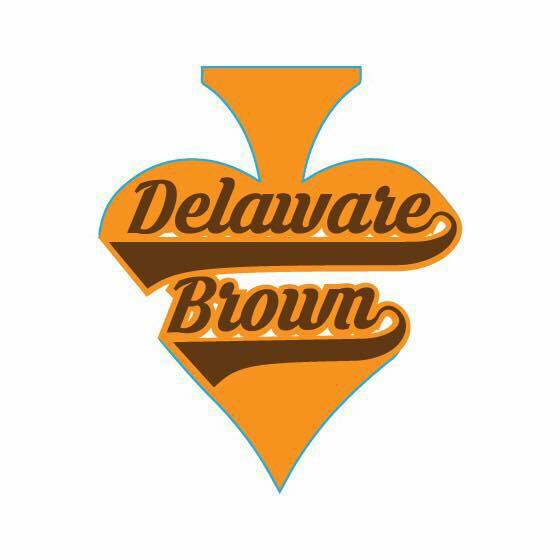 We are loving our new partnership with Donnell from Delaware Brown media! If you have been to one of our events in the last month, you have definitely seen him! Check out the most recent video from our March Mixer! 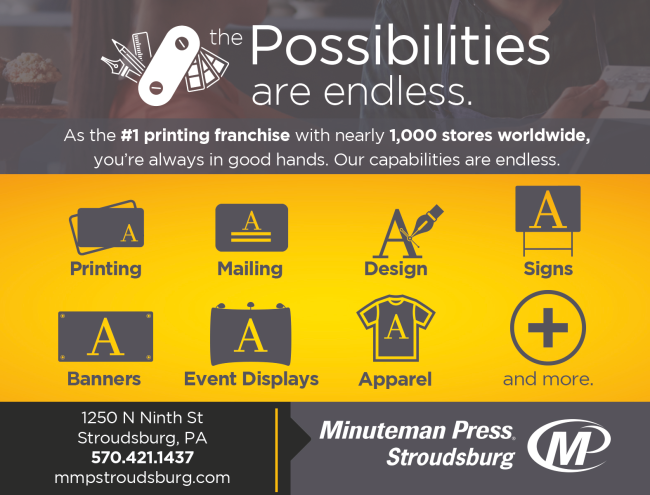 Check out Minuteman Press of Stroudsburg for all of your printing needs! 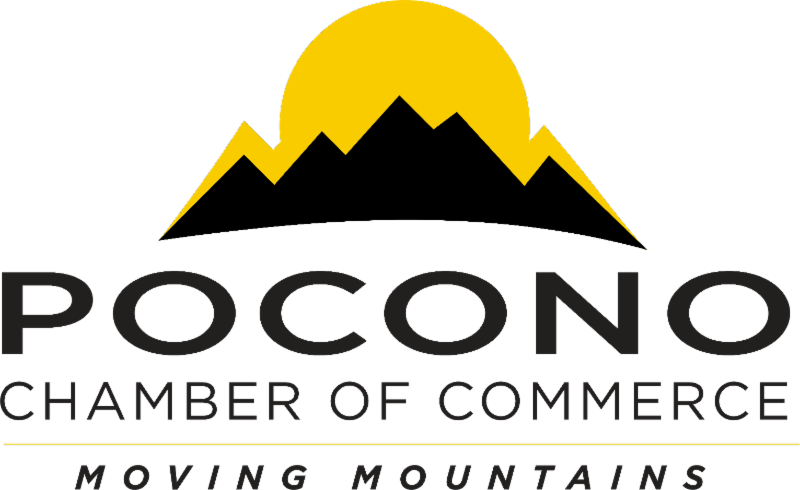 They are a proud partner of the Pocono Chamber, priniting our entire catalog of Women in Business Programs for the 2019 year! Want a great ad in our program? Minuteman will make it look fantastic! Click here to see all they can do for your business! Environmental stewardship is about much more than following established rules and guidelines that protect the air, land and water. It’s about going above and beyond. PPL Electric Utilities wants to help those young adults in its service area who are looking to go that extra mile and enter a profession with earth-friendly ties. To help make that happen, we recently launched our Future Environmental Leaders Scholarship to help high school seniors pursuing an environmentally related career. One winner will be picked from each of seven geographical regions within our service area in central and eastern Pennsylvania to receive $2,000 toward college expenses at either a two-year or four-year school. Our environmental legacy is strong and growing. We recycle tons of wood utility poles, steel, aluminum and other materials, provide free trees to students and communities through our Community Roots program, help provide nesting platforms for osprey, and more. And we couldn’t think of a better way to build on our commitment than to foster future environmental leaders. One key aspect of the scholarship application is a short essay that asks students to explain why they’re interested in pursuing a career with environmental ties. We’re looking forward to reading their responses. Applications are being accepted through April 30, 2019. They will be judged by an internal PPL committee and winners will be announced in early June. PPL employees and members of their immediate families or households are not eligible for the scholarship. To learn more about the scholarship and view the application and rules, visit pplelectric.com/scholarship . For information about all of PPL’s environmental efforts, visit pplelectric.com/environment . We’re excited to be able to offer this scholarship. Help us spread the word, won’t you? Helping a deserving student and doing the right thing for our environment is a great combination. If you have not been to the newest Stoves and Stuff, this is the best time to check it out! This store is simply amazing and a little something for everyone. Heavy emphasis on the "and stuff" they have so much to offer! 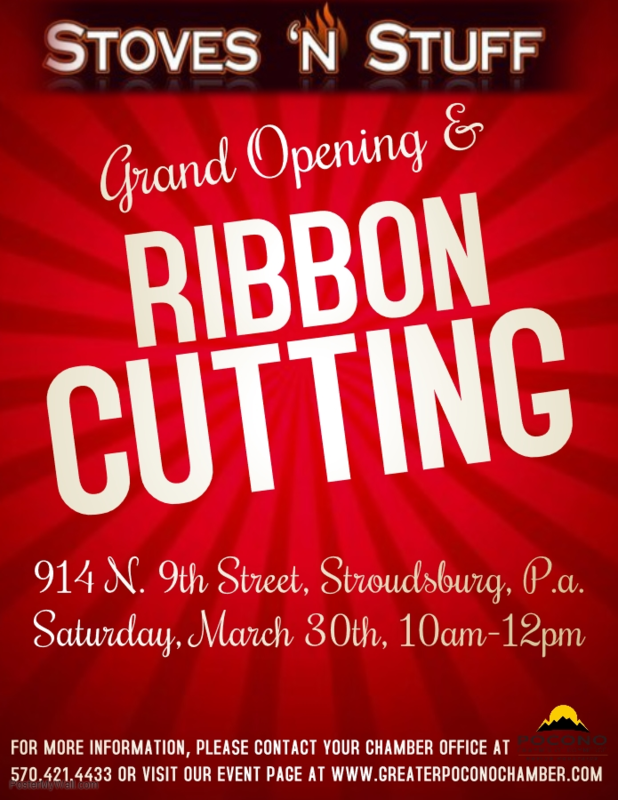 Please join us on Saturday March 30th at 10 AM for the Grand Opening and Ribbon Cutting! 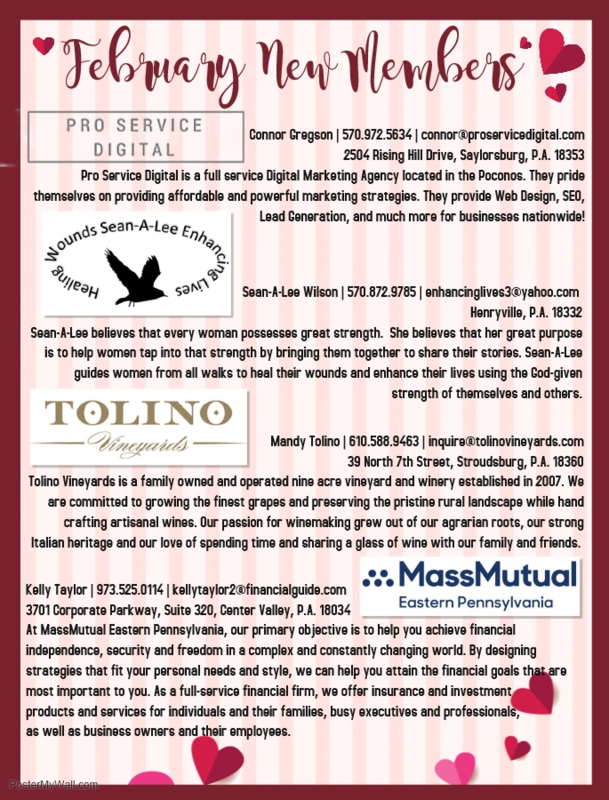 A Proud Partner of the Greater Lehigh Valley Chamber of Commerce! Click here for more great events in the Lehigh Valley!